The Ionic order originated in Ionia in mid-6th Century BC. A true Ionic column normally stands on a base that separates the shaft of the column form the platform. One of the most famous examples of Ionic order columns can be seen in the 6th Century Ionic Temple of Artemis at Ephesus. Also known as the Temple of Diana, it is one of the Seven Wonders of the Ancient World. Ionic columns in GFRC by Stromberg are an impressive element that can transform any building. Esteemed throughout the world for their blend of authenticity, elegance and durability, Stromberg can offer you a wide array of designs and materials for your glass fiber reinforced concrete Ionic columns. With their 30 years of experience, they can make your vision a reality. The experts at Stromberg Architectural Products have extensive product knowledge and a history of excellence. They pioneered the use of GFRC and today it’s their most popular product. The glass fibers won’t rust like steel, making this product rust proof; there’s also no need for a protective covering of concrete. Because of this, GFRC weighs a fraction of what traditional precast concrete weighs. Use glass fiber reinforced concrete wherever you need a light, strong, weather resistant material. 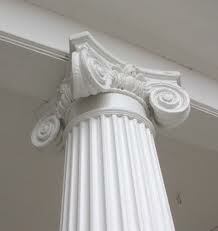 Ionic columns made with GFRC are an excellent choice for any setting. Stromberg uses molds to cast your GFRC columns, so authenticity to detail is guaranteed. They have a reputation for solving design and construction problems for their clients and can effectively handle your order whether you’re working on a small weekend project or a large development. GFRC is an engineered material whose properties can vary depending upon mix design, glass content and production methods. The glass fiber used in GFRC has a higher tensile strength than steel. GFRC won’t burn because it’s made of minerals; it also protects the materials behind it from the heat of the flame. Light in weight compared to stone and terra cotta, its installation is quick and easy, and your shipping costs are reduced. Your GFRC Ionic columns can be cast in an integral color and texture to match their surroundings, or as paint grade that you can finish with any paint. The artisans at Stromberg Architectural Products will partner with you every step of the way throughout your GFRC Ionic Column project. Stromberg is here to help with CAD details, design assistance and all specifications. Contact them today at (903) 454-0904 for your free custom quote, and put their 30 years of experience to work for you.